Why are beauty products spam being constantly posted on AskUbuntu? Its very irritating. I know that this cannot be filtered by bots but aren't there a faster way to delete these spams? There had always been a spam or two every 15 mins or so and then, it takes another 10-15 mins or so before its removed from the site. If it's just one piece of spam, with very few few people on-line it can takes about 15 minutes before it's finally taken down, but on busy days, it takes about a minute and when we man the spam stations during a big spam wave, it takes about 2 seconds to get flagged into oblivion! So keep on flagging! Eventually the spammers will give up! Not the answer you're looking for? 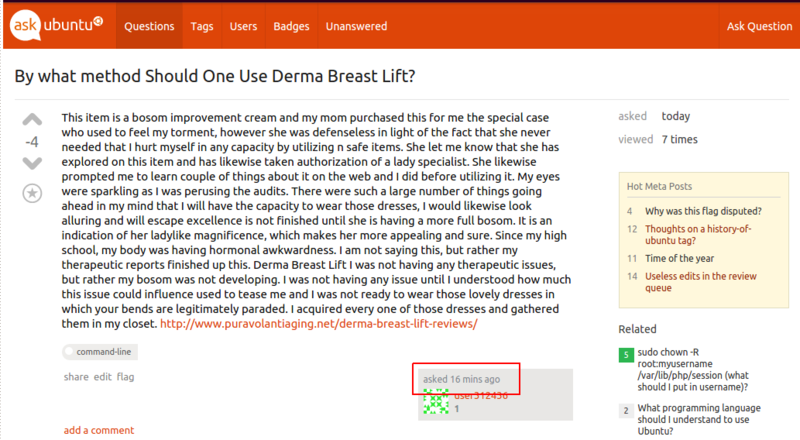 Browse other questions tagged feature-request spam-handling spam .